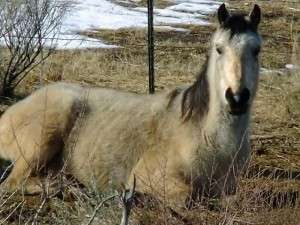 The halfway point of winter in the northern hemisphere has arrived here in Idaho with dry and warm weather. Trapped in some kind of drought, I suppose I should be saying stuff like, “We need snow in the mountains, we need rain on the flats,” or maybe I should be circling around dancing with my arms stretched towards the sky. But I am a pilgrim here from southern climes and must say that I enjoy the mild weather. Last week we peregrinated down to Elko, Nevada for the National Cowboy Poetry Gathering and the mild days and cool nights were much to my liking. We still got to take photos of the snowy flats below Wild Horse Crossing, and the blood red and yellow-orange willows that ganged the banks of the frigid east fork of the Owyhee River. 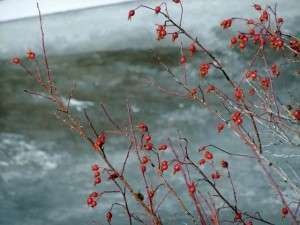 We captured images of lipstick red berries backed by river ice. We shot pictures of horses and pronghorns and starlings and eagles and the thin clouds that scraped the blue like whispered rhymes from the mouths of poets. We took photos of poets, too, and cello players and singers. We took pictures of partiers, painters, big Stetson hats, red cowboy boots, gold-tinted neon signs and all manner of other things Elko. We listened to an array of tunes from traditional drover songs to a capella pieces redolent with the new that lives in the old west…we heard jazz, the blues, folk, cowboy music, Mexican lullabies and Crow Indian chants. I think the number of visitors to the Gathering must have been down this year because things seemed a little less frantic in Elko as we trooped around and met with old friends and new friends. That’s one of the most important things Elko is to me….friends. An amazing compendium of styles…political, poetical, musical, philosophical and generational show up and mingle. 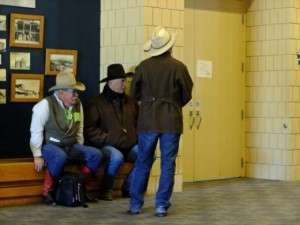 A tolerant mood holds forth and accepts long hair and short hair, cattle rancher and sheep man, octogenarian folk singer and yodeling ten-year-old. Elko is surrounded by mountain ranges that capture snow and shadow like a painter’s canvas. When the winter light lies down at low angles, the land seems to smother the sheen, leaving a splendidly muted scene where ice and rocks and cottonwoods meet. The long draws and dips of the foothills remind me of a soft-voiced mother singing a lullaby to her child. There have been years when you could hardly get out of Elko because of the snow and the wind. One year I set out south to view the Ruby Mountains, but a gale got up and drove the snow so blatantly as to blind me. That year it seemed to snow every night, all night and it was a chore to clean off the windows of the car so you could make it the half mile to the venues to hear Paul Zarzysky recite his poems. Or Henry Real Bird chant in Crow, or Wallace McRae throw down a bucolic challenge to oil and mining companies ravenous for the raw fuels that percolate beneath the surface of the west. This year, the Western Folklife Center brought in a lot of performers from the southwest and that fluttered the chambers of my innards. I lived many years in Arizona and New Mexico, so the music and the poems and the stories all delighted me, drawn from agricultural milieus flavored with the curious mingling of Spanish, Anglo and Native American. That stuff makes my blood run hot. Takes me back to a memory home. A place I can only return to in my mind. The wild land as remembered is now homes and cars and racetracks and highways, but in my mind, my memory, I can see blankets of sheep cover the draws beneath the conical hills of the Sonoran Desert. I see the pine-clad peaks that jut up like isolated islands in a sea of ocotillo and saguaro. I can hear the songs of tamales and conquistadors, of the time before the white man, before the Native American tribes now on the land, the time before….the time of Anasazi, Hohokam and Mimbres culture…petroglyphs and rock art and primitive irrigation systems that served thousands, adobe castles crammed into the naves of canyon rock. It was once my land, the land in which I lived, and still it’s the land of my mind. All hail Elko…where memories rear up out of verses of poetry and song. Sounds like you had a fabulous time. I imagined it would be so. Yep. Good times. You should join us next year. A celebration of the west and intellect. “…a memory home” What a delightful phrase. I’ve never heard those two words put together. Love it. I enjoyed your writing and your beautiful photos! I love cowboys!